Immunohistochemistry-Paraffin: Caspase 11 Antibody (17D9) [ABIN2657624] - IHC-P analysis of a formalin fixed paraffin embedded tissue section of mouse lung using Caspase 11 antibody (clone 17D9) at 1:100 diluton. 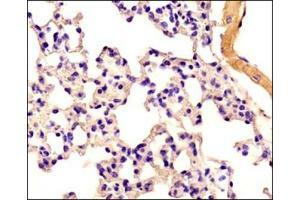 The antibody generated cytoplasmic signal with more intense staining in the bronchiolar epithelium while the staining signal in alveolar cells was relatively low. 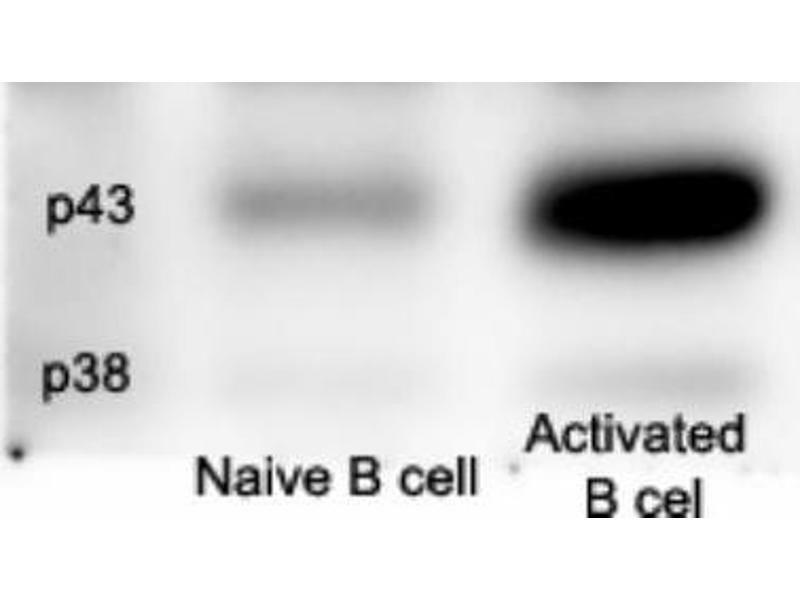 Western Blot: Caspase 11 Antibody (17D9) [ABIN2657624] - Mouse B cell. Image from verified customer review. 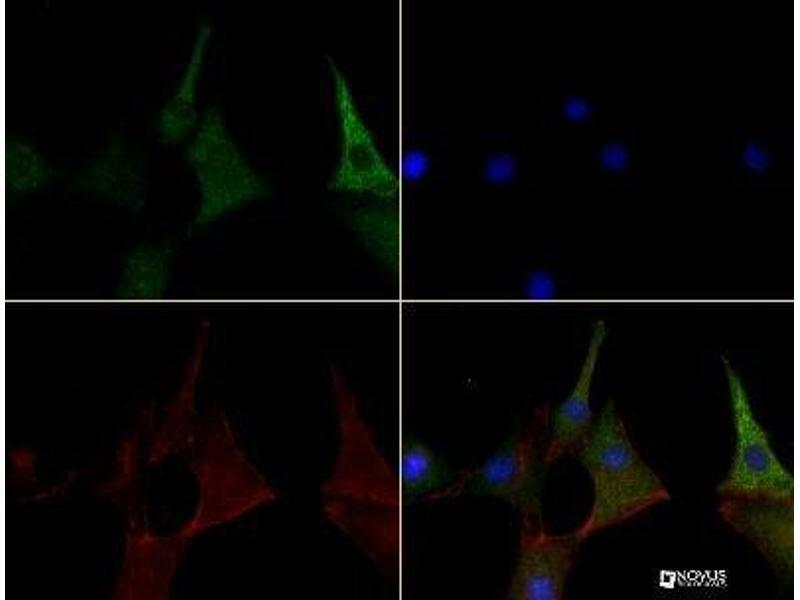 Immunocytochemistry/Immunofluorescence: Caspase 11 Antibody (17D9) [ABIN2657624] - Caspase 11 antibody was tested in NIH-3T3 cells at a 1:100 dilution using a Dylight 488 conjugated secondary antibody (Green). Actin (Red) and DNA (Blue) were counterstained using Phalloidin 568 and DAPI. 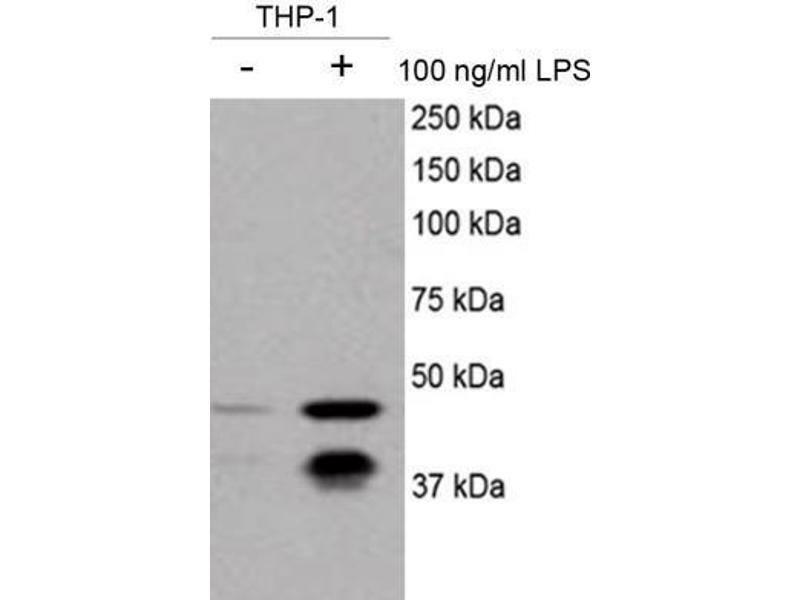 Western Blot: Caspase 11 Antibody (17D9) [ABIN2657624] - Mouse liver extract was separated on a 4-15% gel and transfered to PVDF membrane. 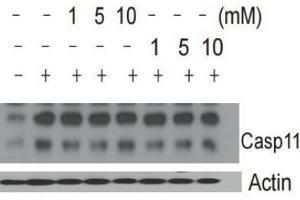 The membrane was probed with anti-caspase 11 antibody and detected with an anti-mouse HRP secondary antibody. 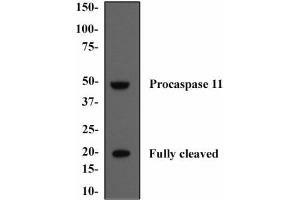 Both procaspase 11 and fully cleaved caspase 11 are detected. 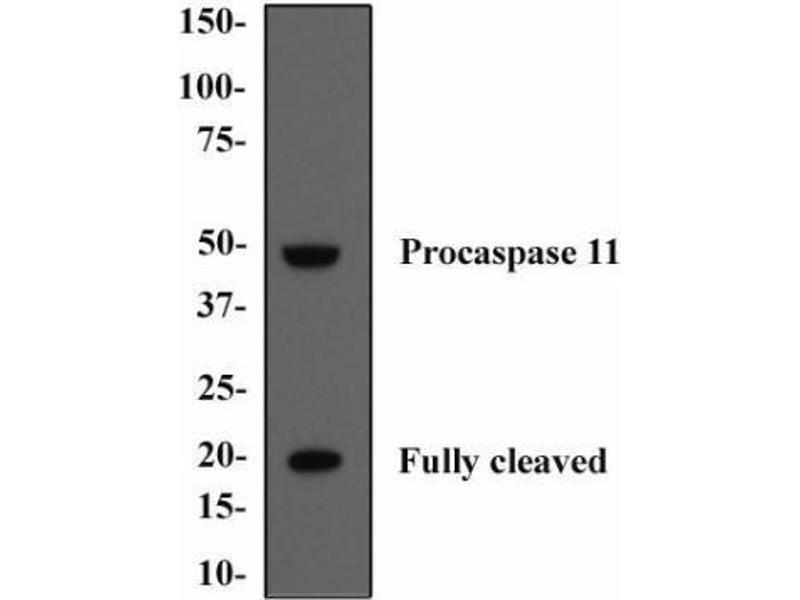 Western Blot: Caspase 11 Antibody (17D9) [ABIN2657624] - analysis of Caspase 11 in LPS stimulated bone marrow derived macrophages using anti-Caspase 11 antibody. Image from verified customer review. 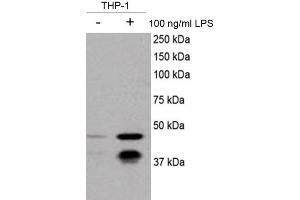 Western Blot: Caspase-11 Antibody (17D9) [ABIN2657624] - Analysis of Caspase-11 in THP-1 cell lysates that were untreated (left lane) or treated (right lane) with 100 ng/ml LPS. Image from verified customer review. 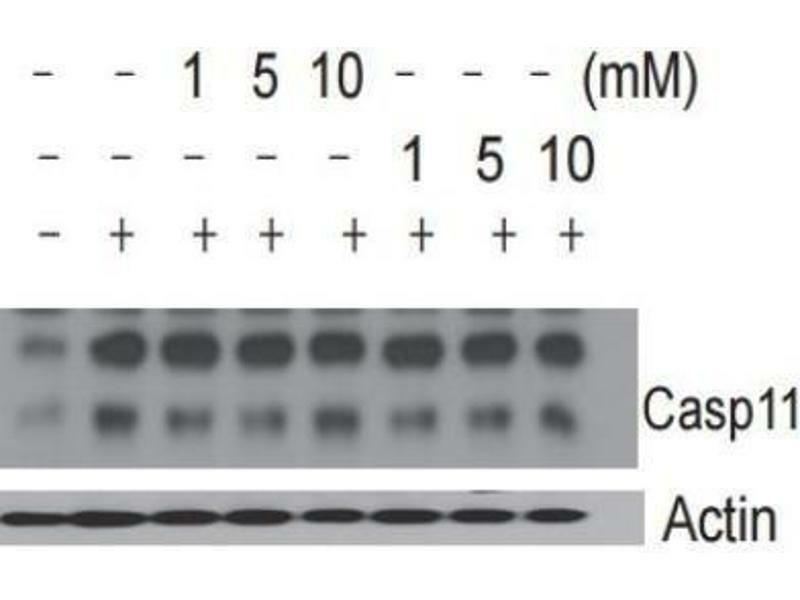 Application Notes Western Blot 5 μg/mL, ELISA, Immunohistochemistry 1:10-1:500, Immunocytochemistry/Immunofluorescence 1:100, Immunoprecipitation, Immunohistochemistry-Paraffin 1:100, Immunohistochemistry-Frozen 1:10-1:500, MicroarrayUse in immunprecipitation reported in scientific literature (PMID 10791975) The observed molecular weight of the protein may vary from the listed predicted molecular weight due to post translational modifications, post translation cleavages, relative charges, and other experimental factors. 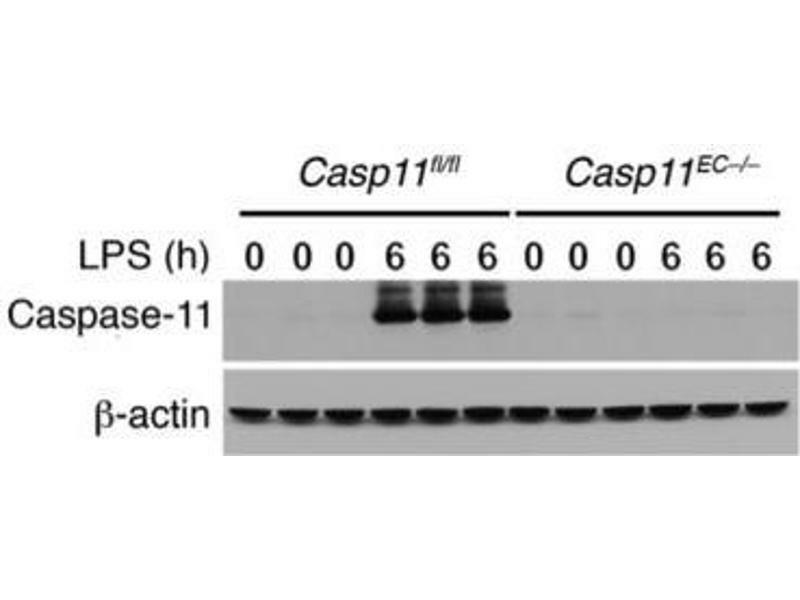 Quach, Moreau, Sandall, Chadee: "Entamoeba histolytica-induced IL-1β secretion is dependent on caspase-4 and gasdermin D." in: Mucosal immunology, Vol. 12, Issue 2, pp. 323-339, 2019 Method employed by authors: Immunoprecipitation (IP) (Sample species: Human). Man, Karki, Briard, Burton, Gingras, Pelletier, Kanneganti: "Differential roles of caspase-1 and caspase-11 in infection and inflammation." in: Scientific reports, Vol. 7, pp. 45126, 2017 (Sample species: Mouse (Murine)). Jin, Oda, Chen, Yang, Zhou, Kang, Valentine, Kefauver, Liao, Zhang, Gonzalez-Martin, Shepherd, Morgan, Mondala, Head, Kim, Xiao, Fu, Liu, Han, Williamson, Xiao: "Differential Sensitivity of Target Genes to Translational Repression by miR-17~92." in: PLoS genetics, Vol. 13, Issue 2, pp. e1006623, 2017 Method employed by authors: Western Blotting (WB) (Sample species: Mouse (Murine)). 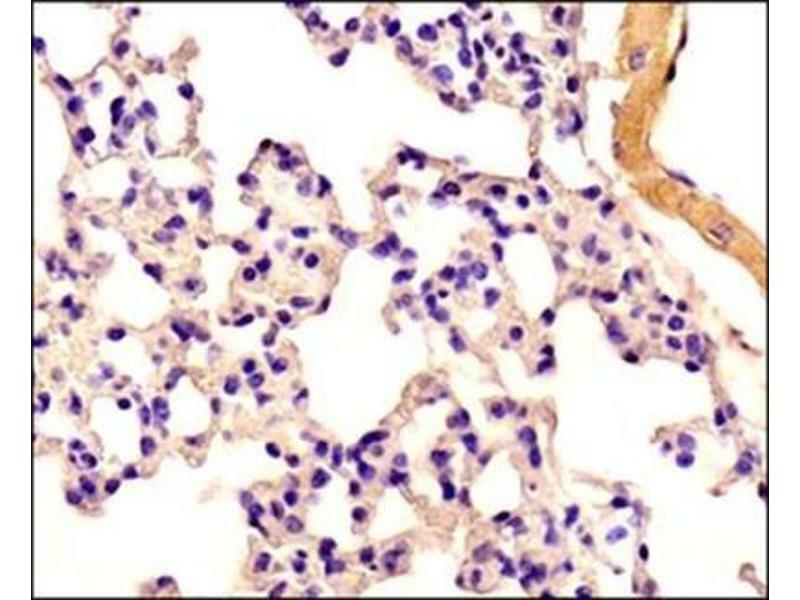 Cheng, Xiong, Ye, Hong, Di, Tsang, Gao, An, Mittal, Vogel, Miao, Rehman, Malik: "Caspase-11-mediated endothelial pyroptosis underlies endotoxemia-induced lung injury." in: The Journal of clinical investigation, Vol. 127, Issue 11, pp. 4124-4135, 2017 Method employed by authors: Western Blotting (WB) (Sample species: Mouse (Murine)). Kerur, Fukuda, Banerjee, Kim, Fu, Apicella, Varshney, Yasuma, Fowler, Baghdasaryan, Marion, Huang, Yasuma, Hirano, Serbulea, Ambati, Ambati, Kajiwara, Ambati, Hirahara, Bastos-Carvalho, Ogura et al. 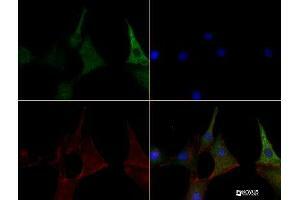 : "cGAS drives noncanonical-inflammasome activation in age-related macular degeneration. ..." in: Nature medicine, Vol. 24, Issue 1, pp. 50-61, 2017 (Sample species: Human). 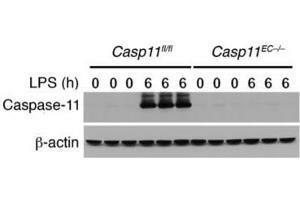 Western Blot: Caspase-11 Antibody (17D9) - Casp11fl/fl and Casp11EC-/- mice (n = 3) were challenged with LPS (40 mg/kg i.p.) for 6 hours. 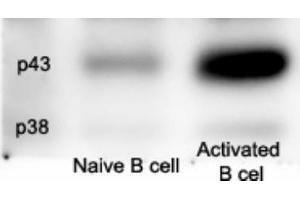 Endothelial Cellss were isolated from lungs, and western blot analysis was performed for pro-IL-1Beta, mature IL-1Beta, and caspase-1 cleavage. This image is from PMID: 28990935.